Justin Holl walked into Air Canada Centre on his own a couple hours before puck drop Wednesday night, with his minor league equipment bag and a bundle of sticks in his hands. TORONTO — Justin Holl walked into Air Canada Centre on his own a couple hours before puck drop Wednesday night, with his minor league equipment bag and a bundle of sticks in his hands. 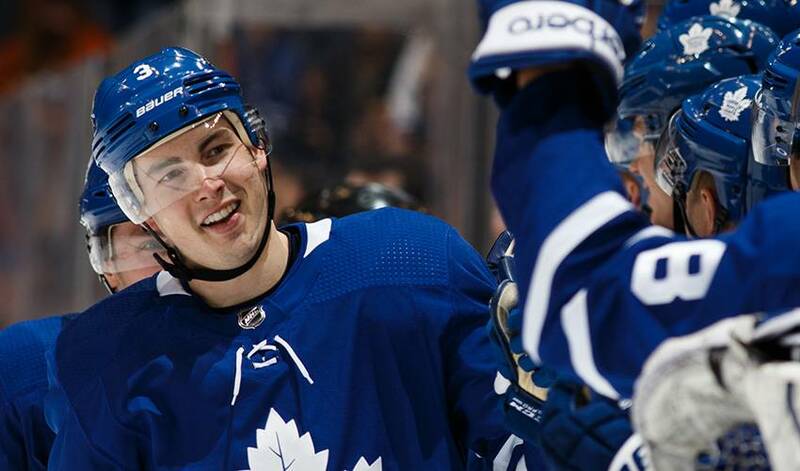 He originally expected to have the day off as he was returning from the American Hockey League's all-star game in Utica, N.Y.
Little did he know he would go on to score in his NHL debut as the Toronto Maple Leafs toppled the New York Islanders 5-0 on Wednesday. "It's almost surreal, you're like 'Wait did that really happen? And you're like, 'Nice, it did,'" said Holl. The 26-year-old Holl joined the Toronto organization on an AHL contract in 2015-16 before earning an NHL two-way deal last season. He had played in 239 minor-league games before appearing in an NHL game despite being drafted 54th overall by the Chicago Blackhawks in 2010. "I have confidence in my abilities, sometimes you have to work a little harder for the things you want," said Holl. "You have faith it's all gonna turn out all right." Holl wasn't the only Leaf skater with his first NHL goal on Wednesday either, as Travis Dermott struck in his ninth career game. Holl and Dermott spent parts of the last two seasons together on the Marlies, making the evening that much more special for the blue-line duo. "He texted me (pre-game) and said, "We're playing together and I've had chills for the last five minutes,'" said Holl. "Crazy, you can't put it into words," said 21-year-old Dermott. "You can't write it up any more perfect with (Holl) up here as my partner. "It all came together perfect tonight." Frederik Andersen was solid, making 28 saves for his fourth shutout of the season for the Leafs (29-18-5). Thomas Greiss stopped 45 shots for the Islanders (25-22-5), who also lost 4-1 at home against the Florida Panthers on Tuesday. "Just really unacceptable the level we're playing at," said Islanders captain John Tavares. "Not gonna win too many hockey games the way we've played the last couple nights." Toronto had three rookie defencemen in the lineup, with regulars Morgan Rielly (upper body), Roman Polak (viral infection) and Ron Hainsey (illness) all scratched. Holl made his NHL debut alongside first-year skaters Andreas Borgman and Dermott. Defenceman Nikita Zaitsev was also back in Toronto's lineup after missing 17 games with a foot injury. A strong first period allowed Toronto to head into intermission ahead 2-0. And it was 4-0 through 40 minutes. Kasperi Kapanen opened the scoring 5:37 into the game by jamming in the loose puck laying near the goal line. Auston Matthews doubled the lead when he picked up a Zach Hyman rebound in the slot and wristed it glove side on Greiss at 13:39. Jake Gardiner started the play with a long outlet pass and picked up the other assist to extend his point streak to six games. Just as soon as it appeared that the Islanders were gaining some traction in the second period, Mitch Marner skated into the slot and re-directed a Nazem Kadri pass to make it 3-0 at 10:32. Tavares had a great chance to put his team on the board while on the power play, but he juggled the puck at the side of the open net before getting off a weak shot that Andersen had no trouble with despite being on his back. Dermott finished off a pass from William Nylander with 1:01 to play in the second to make it 4-0. Matthews skated right to the Islanders net to pick up the puck as a keepsake for Dermott. "He gets excited any time anybody scores a goal. You can hear him probably up in the press box," said Matthews. "Him scoring his first, he was pretty pumped up." Andersen robbed Tavares with his glove on the doorstep early in the third period to keep his shutout bid alive. "When you play a fast team like that it's always a challenge," said Islanders coach Doug Weight. "They came at us hard and looking back we had some really good chances we missed. "Our guys battled, we just have to find a way to be better." Holl made it 5-0 with a wrist shot from an off angle that slipped through Greiss' legs at 3:42. This time it was Hyman who collected the puck for his teammate. "Obviously, good for those kids," said Leafs coach Mike Babcock. "You don't get to score your first NHL goal very often — one time."